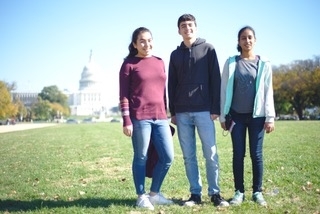 From November 1 to November 5, Nikitha Fernandes, Santiago Piva, Fiona Reyes, and Curtis Ullerich attended the National Youth Maker Summit in Maryland. 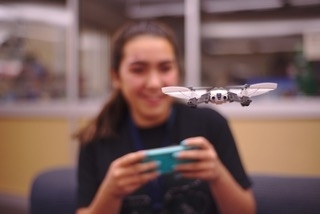 We attended this conference to reconnect with 4-H'ers who we met at the Computer Science Pathway Training this summer in Utah, and to share our progress with the Computer Science project in California. We led a workshop on Cryptography, which was developed with the Computer Science Unplugged curriculum. We also attended so that we could lead a workshop about Cryptography that we created using the Computer Science Unplugged curriculum. We plan to lead this workshop again at California 4-H conferences like the Bay/Coast Youth Summit and State Leadership Conference. 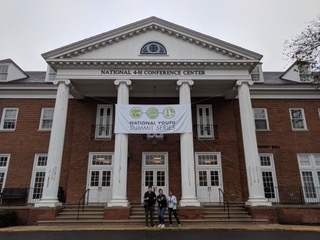 Since we arrived to the National 4-H Conference Center a day early, we were able to explore a little bit of Washington D.C. We visited the Smithsonian National Museum of Natural History and walked around the National Mall. Once the conference began, we dove straight into learning about the importance of the Maker movement. 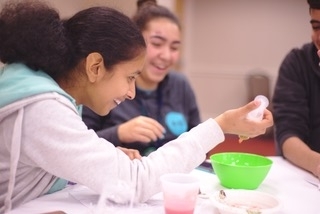 Everyone can be a maker, and this is a culture that 4-H has had ever since it was founded. A maker is someone who makes things. Makers are people who are producers, that create things for themselves and others. They can make anything, from creating a vegan pork rind company, to having a fashion design company or to working as an engineer at Google. In fact, these are all makers that we were able to meet at the National Youth Maker Summit. Creating portable kits that contain soldering irons and mini circuit boards to make light-up 4-H pins. Uploading instructional videos about how to use 3D printers. These videos would encourage members to make 3D printable objects and to use Scratch or Python to create things which they can enter at fair and in competitions. Uploading videos on wearable art using LEDs. This would encourage other members to also realize their potential as makers, which would spread awareness about the Maker Movement. Also, we would like to bring the Computer Science Unplugged activities (which were a success) to areas of 4-H camp. We could do this by leading a recreation session, having a booth in the arts and crafts area, or having an activity for the clovers. If you would like to know how you can use these ideas in your county, please contact the California Computer Science Pathway Team at 4hcs@googlegroups.com.